"The short-term-memory part of your mind-the part that tends to hold all the incomplete, undecided, and unorganized "stuff" - functions much like RAM on a personal computer. Your conscious mind, like that computer screen, is a focusing tool, not a storage place. You can only think of 2 or 3 things at once. But the incomplete items are being stored in the short-term memory space....there's limited capacity, there's only so much "stuff" you can store in there and still have that part of your brain function at a high level. They're constantly distracted, their focus disturbed by their own internal mental overload." This "full mind RAM" concept is why you'll sit at your computer and find yourself unable to write or make a single solitary thing, instead retreating to get lost down the Google or YouTube rabbit hole. 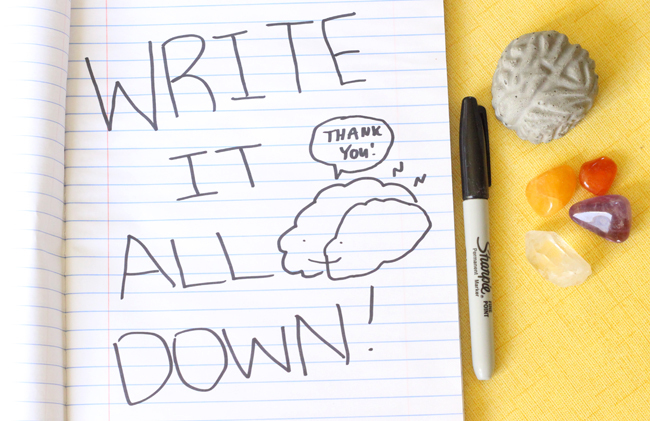 Writing down EVERY TINY THING on your mind is a huge help! It's helped me with meditation, and more importantly, it's helped me with meditation via being sucked into a productive work groove, my favorite thing to be stuck in! I hope you try this and let me know how it works. I made three lists, there's over 100 items on them and they're not done yet, but they've been very helpful. Take as long as you need because you need to think of EVERY little action that's been on your mind to do in your work, creative and personal life. Make your brain cry tears of joy. Write everything you have to do. Clear your mind RAM. What things do you do to increase productivity or creativity? What do you take pictures of, is it business stuff or everything? I have spreadsheets lists to keep me in line. Actually putting even the mundane things on papaper and out of my mind has been very helpful. For it to work, write aaaalll the stuff that's bombarding your brain and keeping you from being able to work. It's really worked for me. :D I've almost nailed a design that I haven't been able to perfect for months. This works for me occasionally :) it's a good technique to try! I love it. I'm still working on getting every little thing how but it's taken a lot off my mind. It's definitely helpful for scatterbrain scenarios, haha. I'm the same way. This was my one New year's Resolution, to write lists. I have some sort of mental block against list writing, so it's been hard. I will try this technique! I love GTD! I actually now do twice weekly Weekly Reviews, including the Mindsweep you speak of! Glad someone else heard of him and his methods! They are so crazy helpful! To do lists are a huge part of my life! Without them, I am a mess! They really do make us productive. Indeed! I love doing David's method because you write out every little thing on your mind that's bothering you and it really does whisk it out of the way so you can focus better. I love a to-do list. However, I'm still childishly writing down things I've already done, just for the satisfaction of ticking them off! I guess it might kick start my subconscious into feeling productive?